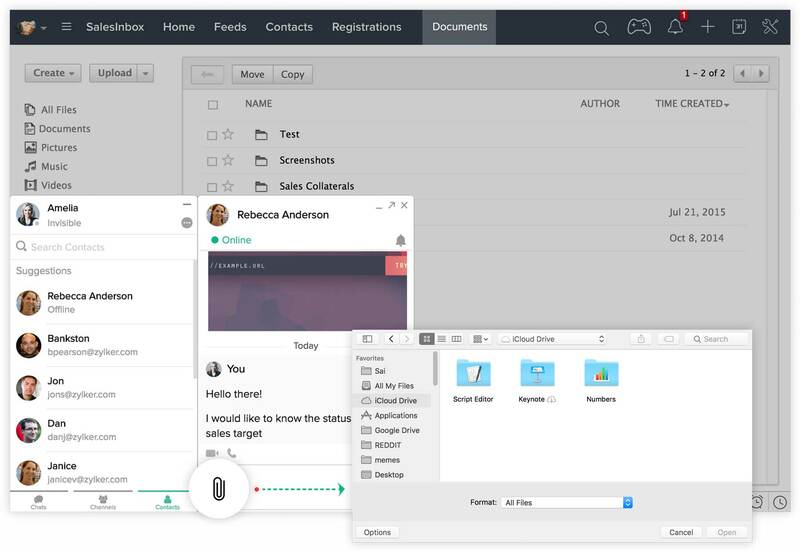 Bridge the gap between your sales, marketing, and support teams, and give them the flexibility to collaborate in real time and communicate deliverables across departments. With access to a shared customer database and real-time messaging tools, every team member can work together to deliver a consistent customer experience before, during, and after a sale. Drive teams toward a common goal. Every customer-facing team needs to deliver on daily tasks while also discovering new opportunities. Project management tools such as milestone tracking, task lists, shared calendars, forums, and reporting help your teams stay organized and on track with their objectives - at every stage of the customer life cycle. Your sales, marketing, and support teams are cross-functional, working hand in hand to achieve a common goal. 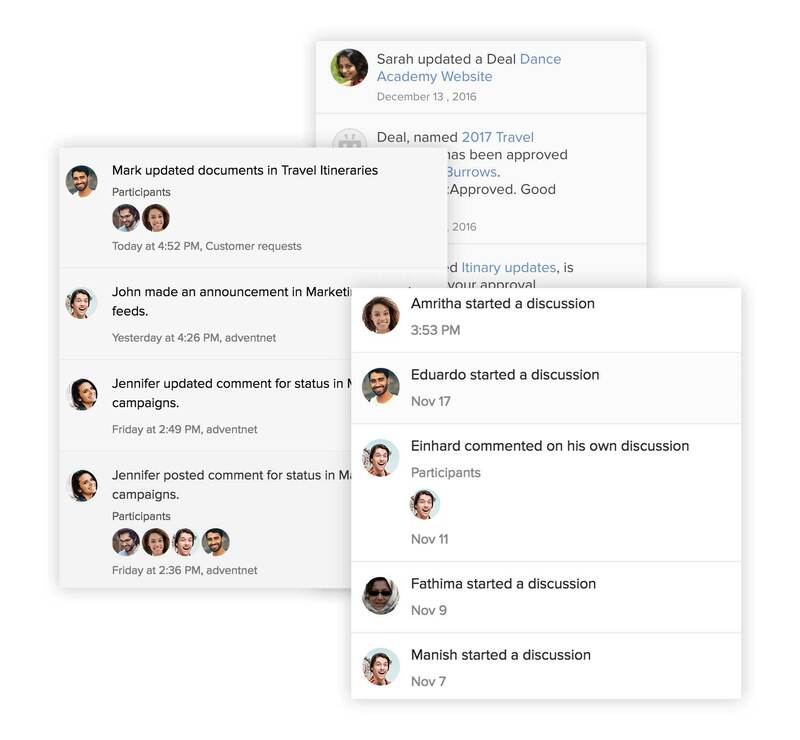 From idea generation to campaign execution, Zoho CRM Plus uses feeds to help your teams discuss ideas, share status updates, and communicate deliverables for faster decision making and more transparency. Stay updated on the projects and developments you care most about. Receive instant notifications for upcoming meetings, tasks or support tickets assigned to you, customer record updates, and more. Get immediate feedback from other team members by tagging them in a shared document or presentation. Real-time conversations across multiple teams. As your business grows, so do your teams. You could end up spending a lot of time finding the right information you want when it is buried deep under long email threads. With Zoho CRM Plus, all your team communication is unified in one place. Connect with anyone in your organization in real time, share files and make calls, right from your desk. Quickly and easily share your documents, spreadsheets, presentations, and PDFs with anyone in your organization. 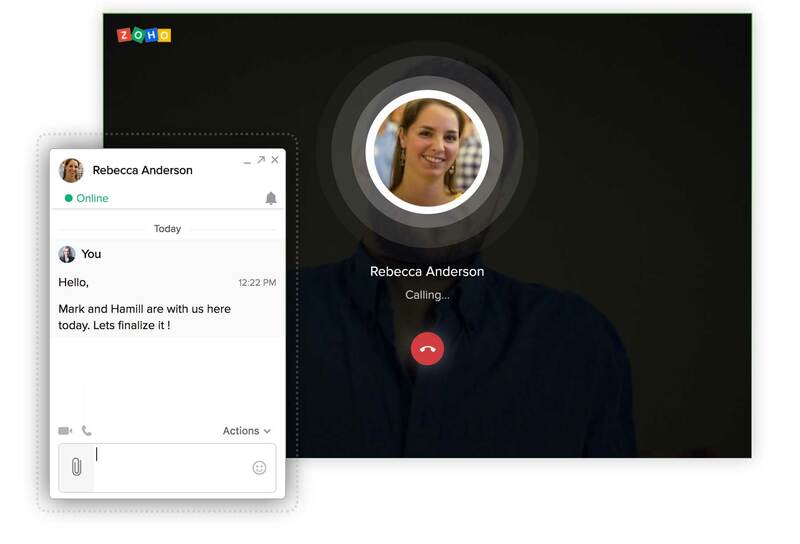 Instead of setting up complicated video conferences, start a video chat with anyone in your organization. Invite your entire team over for a group chat, and eliminate the need for lengthy email threads. Cut to the chase with @mentions, and make your messages informal through emojis, GIFs, or photos.